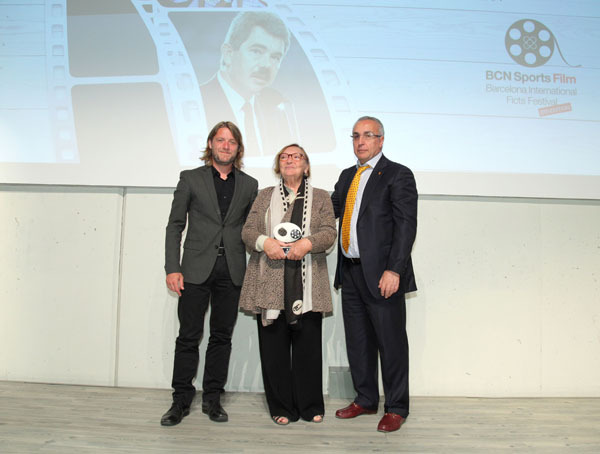 The 25th anniversary of Barcelona’92 Olympic Games, has been very present in this year’s edition of the BCN Sports Film Festival. The tributes awarded during the opening ceremony were dedicated to people strongly involved with the Olympic and Paralympic games of 1992. Pascual Maragall who was the Mayor of Barcelona during the Olympic Games and is also the ex-president of la Generalitat de Catalunya. He has been awarded this tribute to thank him for his contribution to the world of sports. Athletes Jesús Ángle García Bragado and Miriam Blasco Soto have been recognized for their sports career, Jesús Ángel started his Olympic trajectory in the Barcelona‘92 games and he has continued to extend said path up until Rio 2016, becoming the only sportsman in the world who has participated in 7 Olympic editions. For her part, judoka Miriam Blasco, was the first of many Spanish Olympic sportswomen to attain the Olympic Gold. Guillermo Cabezas Conde, one of the biggest promoters of the Paralympic sports, as well as founder of the Spanish Federation for Paralympic Sports and President of the International Association for the Disabled. The memory of the Barcelona Olympics were also present during the Parallel Activity with the `participation of Paloma del Río, journalist for RTVE, has worked broadcasting in 14 Olympic Games since 1988; José Ramón Díez, Production Deputy Manager RTO ’92 during the Olympic games of Barcelona ’92, as well as Producer of the opening and closing ceremonies for Barcelona 1992, Sidney 2000, Athens 2004, Turín 2006, Pekín 2008, London 2012, And the Sochi 2014 Olympic Games; last but not least Isidoro Moreno, Engineering Chief for OBS (Olympic Broadcasting Services). A majority of the screening sessions carried out this week have included productions related to the Olympics.